The global buyers and experts at Whole Foods revealed their most anticipated and innovative food trends for 2019. These ten trends include Pacific Rim flavors, shelf-stable probiotics, eco-conscious packaging, faux meat snacks, and some new varieties of hemp-infused products. You can expect to see these food influences take off throughout this year. These trend predictions were carefully thought out based off of consumer preferences/data, expertise in product sourcing, and by participating in worldwide food and wellness exhibitions. Pacific Rim Flavors– have been a top trend for Whole Foods. They’ve announced its Market and 365 value brands will launch a new line of products inspired by Pacific Rim fruits. Items to expect? They’ll be releasing a tropical guava vinaigrette, pineapple passionfruit sparkling water, mango pudding mix, and passionfruit coconut frozen fruit bars. Going beyond the fruit, we can also expect to see ingredients like longganisa (a Filipino pork sausage), dried shrimp, cuttlefish, and shrimp paste. Shelf-Stable Probiotics– have been trending for a couple years now, but Whole Foods has expanded beyond the refrigerated sections. New strains of probiotics, such as Bacillus coagulans GBI-30 and Bacillus coagulans MTCC 5856, are making more shelf-stable products possible. Wellness focused brands are making it easier than ever to get more probiotics in our diets by adding functional probiotic ingredients to some pantry staples such as granola, oatmeal, nut butters, soups, and nutritional bars. An unexpected place you’ll be able to find probiotics is in the cleaning aisle. With brands like Counter Culture Probiotic Cleaning Tonic even your household will receive probiotic benefits. And lastly, beauty brands are now including pre and probiotic-based ingredients throughout sunscreen and other topical body care. Phat Fats– Fats have made a huge comeback. We went from the low-fat craze in the ‘90’s to being less afraid of fats. With the rise of keto, paleo, grain-free, and vegan diets, fats are being highlighted in creative and convenient foods. Whole Foods suspects that along with these “phat fats” higher protein and lower-carb option combos will continue to trend across easy snacking categories. We’re now seeing new integrations of fat sources- like keto friendly nutrition bars that are filled with MCT oil powder, coconut butter chocolates, and vegan coffee drinks. Next Level Hemp– The majority of us are well aware that hemp seeds and hemp oil are great boosters for your skin and nutrition. However, there’s a new interest in the potential benefits stemming from other parts of the plant that has many brands looking to explore the booming cannabis business. Whole Foods predicts that the current offering of hemp will become much broader as researchers find more benefits from other parts of the plant as consumer interest in cannabis continues to accelerate. You’ll be able to find Andalou Naturals (a skincare brand) that now has an entire line dedicated to this called CanaCell. Faux Meat Snacks– Plant based foods/snacks have been on the rise for a couple of years now. However, the buyers behind Whole Foods predicts that even more people are exploring plant-based snacking. The king trumpet mushroom will play an important role, showing off their flavor and texture in tasty jerkies that provide pork and beef-like umami. Brands like Snacklins, Louisville Vegan Jerky Co., and Pig Out make plant-based snacking a whole lot more innovative. Eco-Conscious Packaging– it’s no secret that packaging is one of sustainability’s biggest nightmares. However, we’re now seeing brands making the switch to compostable packaging. Whole Foods is also seeing an emphasis on bringing your own produce and shopping bags. They’re also seeing traditional single-use packages now go multi-use (and some compostable) in terms of food wraps made from beeswax, as well as waxed or silicone plastic bags. Trailblazing Frozen Treats– There’s a certain nostalgia we all have about ice cream, however companies are now experimenting with contemporary bases like avocado, hummus, tahini, and coconut water. Marine Munchies- Beyond Seaweed– Seaweed snacks have been popular for quite some time now. However, we’re about to be seeing even more ocean influence within our grocery aisles. Sea greens are showing up in items like butter, kelp noodles, puffed snacks made from water lily seeds, plant-based tuna made from algae, and crispy salmon skins and kelp jerkies. Snack-Time Upgraded– Snacking has become an occasion on its own. With the rise of meat/cheese and veggie boards, snacks have definitely been seen as mini meals. Whole Foods predicts that we’ll be seeing more elevated snacks with better ingredients using organic sugar, gluten free, and grain free ingredients. Purchases That Empower– Consumer purchasing power continues to motivate changes in food, beverage, and beauty industries. 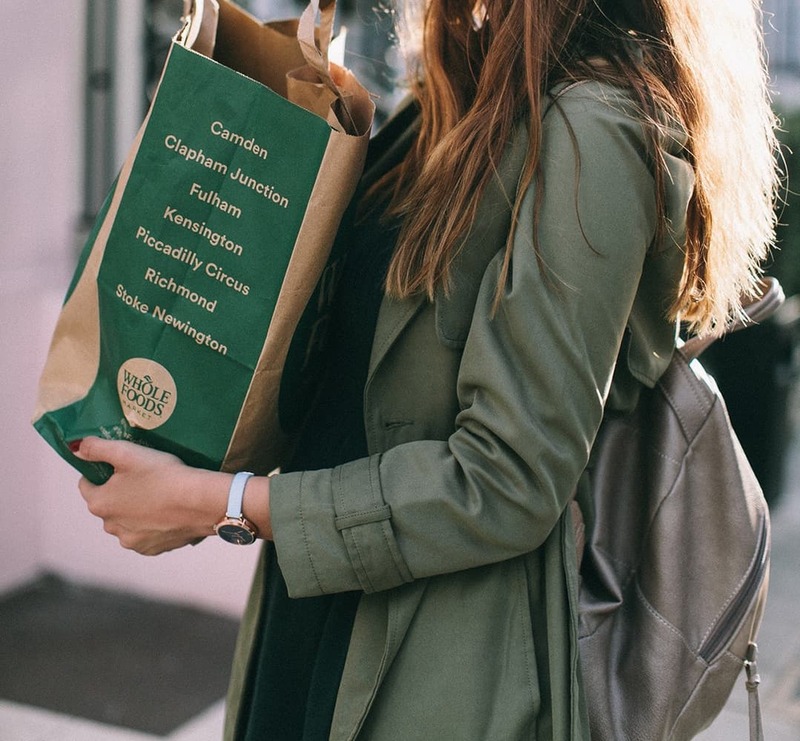 Whole Foods strives to align with other like minded brands who help pave the way for environmental stewardship, animal welfare, women-owned businesses, farms, and support programs to alleviate poverty throughout the world. Some of these brands include Chobani, Frontier Co-op, Naked Juice, Wallaby Organic, and Papyrus Recycled Greeting Cards.